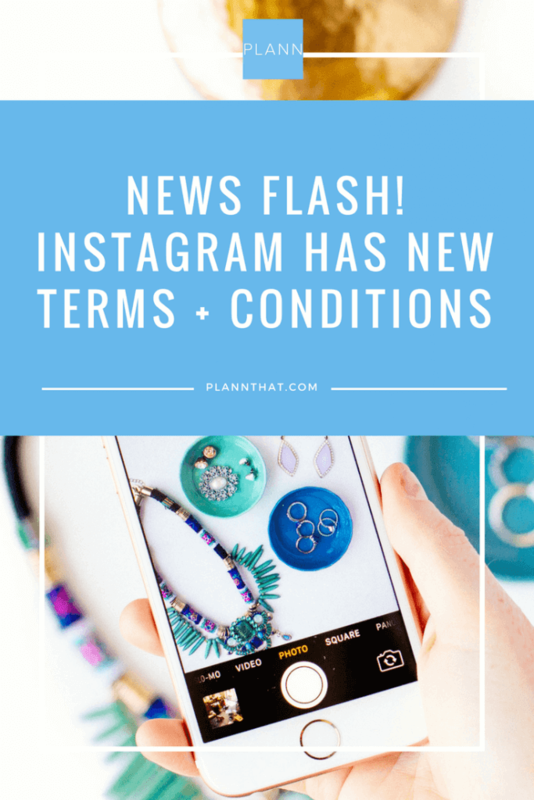 Curious to learn more about the updates on Instagram Terms and Conditions? Then you are in the right place. In true Instagram Fashion, the Social Media giant has changed something pretty major overnight. 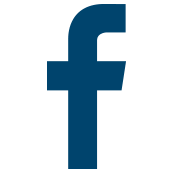 Unless you’ve been hiding under a rock for the past month, you may have heard about the ongoing investigation into Facebook and the privacy of user data. This latest Instagram change focuses on the way that Instagram will display, use, and give access to your data. Sounds a bit techy right? Don’t worry, we’ve put together a juicy [and quick] summary of exactly what you need to know. 1. Instagram collects different kinds of information from your device, like how you tap and scroll to help distinguish humans from bots and fraud. 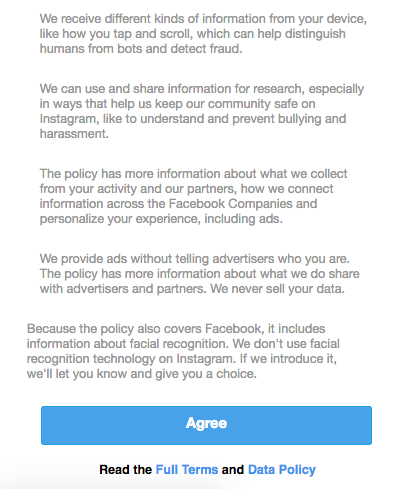 What this means: In order to keep Instagram a fun and happy place, with as few spammy comments and accounts as possible, Instagram has a few ‘triggers’ set up to know when an account could actually be run by a bot. Unfortunately, this isn’t a perfect system, so be careful. I know for myself that because of my super-human typing speed of 90WPM (yep, really) that Instagram often thinks I am a bot if I leave comments too quickly. That leads to my account not being able to leave comments for a while. 2. Instagram collects the content, communications and other information you provide when you use the app including when you sign up for an account, create or share content, and message or communicate with others. What this means: Instagram is always watching. 3. 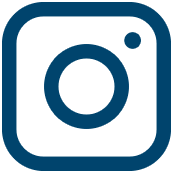 Instagram collects information about the accounts and hashtags that you are connected to and how you interact with them, such as the people and hashtags that you interact with the most. What this means: Instagram keeps an eye on who and what you interact with so that they can customize your experience in the app. For example: if you start liking and commenting on a bunch of photos of cute puppies, it is likely that soon after your explore tab will start to show more puppy photos. This is all about making Instagram *irresistible* to you and making you want to come back for more. 4. Instagram collects information about how you use the app such as the types of content you view or engage with; the features you use; the actions you take; the people or accounts you engage with; and the time, frequency and duration of your activities. What this means: The specific line about Instagram monitoring the time, frequency, and duration of your activities helps to inform business accounts and their analytics. If Instagram didn’t track this information, your Instagram business analytics wouldn’t work. 5. We do not claim ownership of your content that you post on or through the Service. Instead, when you share, post, or upload content that is covered by intellectual property rights (like photos or videos) on or in connection with our Service, you hereby grant to us a non-exclusive, royalty-free, transferable, sub-licensable, worldwide license to host, use, distribute, modify, run, copy, publicly perform or display, translate, and create derivative works of your content (consistent with your privacy and application settings). You can end this license anytime by deleting your content or account. However, content will continue to appear if you shared it with others and they have not deleted it. What this means: This is pretty straightforward – nothing has changed here. Yay! 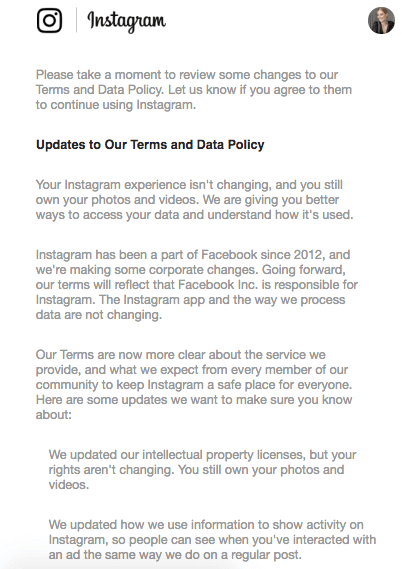 If you’d like to make sure you’ve had a read of the Instagram Terms and Conditions, we aren’t going to stop you! In this techy world we live in, it can be so tempting to skip past terms and conditions just so we can download that new app or sign up for an account for a really cool online store. But, if you want to really be in the know about what is going on with your data, it is important to take a few minutes to read over what you’re signing up for. Did you enjoy this article? Don’t be shy! Share it around the interwebs with your fellow Instagrammers. 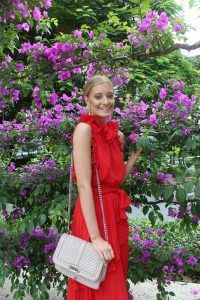 Originally from New Zealand, Mackayla has lived in sunny Queensland for 10 years now and has been hosting Instagram Marketing Workshops for Small Businesses in the Fashion and Beauty industry.